Why have historians been so willing to overlook the despotic actions of the United State's own presidents? Amazing low sale price in defense of authentic freedom as versus the presidency that betrayed it! Everyone seems to agree that brutal dictators and despotic rulers deserve scorn and worse. But why have historians been so willing to overlook the despotic actions of the United States' own presidents? You can scour libraries from one end to the other and encounter precious few criticisms of America's worst despots. The founders imagined that the president would be a collegial leader with precious little power who constantly faced the threat of impeachment. Today, however, the president orders thousands of young men and women to danger and death in foreign lands, rubber stamps regulations that throw enterprises into upheaval, controls the composition of the powerful Federal Reserve, and manages the priorities of swarms of bureaucrats that vex the citizenry in every way. It is not too much of a stretch to say that the president embodies the Leviathan state as we know it. Or, more precisely, it is not an individual president so much as the very institution of the presidency that has been the major impediment of liberty. The presidency as the founders imagined it has been displaced by democratically ratified serial despotism. And, for that reason, it must be stopped. Every American president seems to strive to make the historians' A-list by doing big and dramatic things—wars, occupations, massive programs, tyrannies large and small—in hopes of being considered among the "greats" such as Lincoln, Wilson, and FDR. They always imagine themselves as honored by future generations: the worse their crimes, the more the accolades. 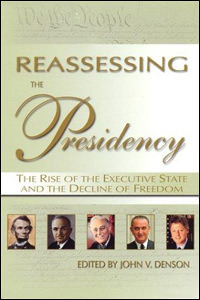 Well, the free ride ends with Reassessing the Presidency: The Rise of the Executive State and the Decline of Freedom, edited by John Denson. This remarkable volume (825 pages including index and bibliography) is the first full-scale revision of the official history of the U.S. executive state. It traces the progression of power exercised by American presidents from the early American Republic up to the eventual reality of the power-hungry Caesars which later appear as president in American history. Contributors examine the usual judgments of the historical profession to show the ugly side of supposed presidential greatness. The mission inherent in this undertaking is to determine how the presidency degenerated into the office of American Caesar. Did the character of the man who held the office corrupt it, or did the power of the office, as it evolved, corrupt the man? Or was it a combination of the two? Was there too much latent power in the original creation of the office as the Anti-Federalists claimed? Or was the power externally created and added to the position by corrupt or misguided men? There's never been a better guide to everything awful about American presidents. No, you won't get the civics text approach of see no evil. Essay after essay details depredations that will shock you, and wonder how American liberty could have ever survived in light of the rule of these people. Contributors include George Bittlingmayer, John V. Denson, Marshall L. DeRosa, Thomas J. DiLorenzo, Lowell Gallaway, Richard M. Gamble, David Gordon, Paul Gottfried, Randall G. Holcombe, Hans-Hermann Hoppe, Jeffrey Rogers Hummel, Michael Levin, Yuri N. Maltsev, William Marina, Ralph Raico, Joseph Salerno, Barry Simpson, Joseph Stromberg, H. Arthur Scott Trask, Richard Vedder, and Clyde Wilson. from Europe The best bang for the buck. Want to understand American history?